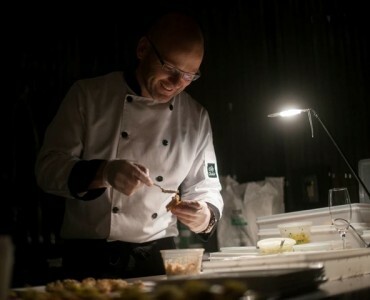 Ottawa’s preeminent Chef (and co-host of Food Network’s Chef Off) joins Chef Dave Smart of Front and Central for a celebration of modern cuisine inspired by the film Now, Forager. Each course comes paired with wine. Additional wine and beverages are available for purchase from the restaurant. Due to the capacity of this location, some seating may be communal, but let it be known that you will be sharing your meal with very like-minded individuals. The restaurant will do its best to ensure parties are seated together. Tax & gratuity are included in ticket price. Born in Leicestershire, England, and raised in Montreal, Michael Blackie has been cooking for almost 27 years on three continents. Over the past decade, he’s worked at some of the world’s finest hotels including the Fairmont Pierre Marques (Mexico) and the Oberoi (Bali), an exclusive five-star facility voted the world’s best boutique resort by Leading Hotels of the World (2002) and listed on Cond Nast’s “hot list”. Among his many career highlights, Chef Blackie held executive sous chef and acting chef positions at the prestigious and world-renowned Mandarin Oriental in Hong Kong. 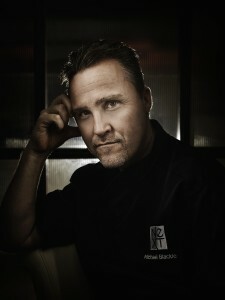 In 2003 Michael returned to Canada and was responsible for the opening of Brookstreet hotel as the Executive chef. Within 4 months of opening Brookstreet was awarded the prestigious four-diamond rating from CAA for the dining room Perspectives. In 2009 Michael joined the National Arts Centre as the Executive chef and Director of Food and Beverage. During his tenure Michael created “Celebrity Chefs of Canada” two years running this event showcased the talents of 18 chefs from across Canada. This unique event garnered national attention. In 2010 Michael was the co-host of Chefoff! A seven-part Food Network produced show that showcased the antics and challenges of two chefs, as they battled for number one position. Chef-off was nominated for a Gemini award in 2010, in the category of reality TV. Currently Michael is the co-founder Nextfood.ca a 11,000 SQFT unique facility located in the west end of Ottawa, featuring casual dining, events, catering and take home. Nextfood.ca represents the fruits of Michael’s dedication to his craft and is proud to call this place his home. Passions are like vegetables. They start with a single seed, and over time, if nourished properly, they grow. The seed of Chef Dave Smart’s culinary passion was planted at a young age (the antics of Jack Tripper must have inspired more than one budding chef), but it took years for that seed to sprout. Dave started his career as an engineer. Even during this twenty year tenure, however, he was lured by the kitchen and by one ingredient in particular: garlic. He and two friends would gather on Tuesday nights for “Garlic Night” to cook (with what ingredient other than…) and entertain a host of friends. Inspired by the potential he found in food, it was not long before Dave kicked his collaborators out the kitchen to invent and compose his own meals. So the chef in Dave Smart developed, leading eventually to his placement at Le Cordon Bleu Culinary Arts Institute in Ottawa. And you know what they say about the rest… it’s history. After his education and internships with prominent chefs in Ottawa, Dave found his way back to his home province of Nova Scotia and to the town of Wolfville, a place that had always drawn his culinary curiosity. Dave Smart has now opened Front & Central, a casual restaurant with exquisite food, in the space that has been home to some of the province’s most outstanding restaurants. There is no doubt that he will live up to his predecessors. His goal, however, is more humble: he aims to nourish the mind, belly and soul.